In the eighth century, a Javanese Buddhist Priest, Rsi Marhandya saw a distant light rising from the earth to the sky and returning again. So Rsi organized a large group of men and women to find the place which was the source of the light. On this first journey he found a beautiful island as we know now as Bali. By the time Rsi and the search party eventually reached the mountains they came across Taro (30 minutes from Ubud) where he and his men fell ill and many died, they returned to Java where Rsi had another vision, regrouped his men and set out on his quest again. After a long journey he finally found the place of the light in the central mountains of Bali, Ubud and this time built a sacred temple on the site. 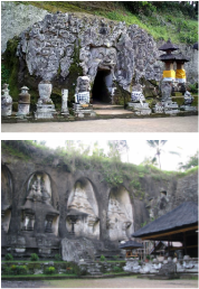 Another beautiful temple built around this time was Gunung Kawi, an 11th century temple complex in Tampaksiring north east of Ubud in Bali, Indonesia. It is located on the river Pakrisan. The complex comprises 10 rock-cut candi (shrines) carved into the cliff face. They stand in 7m-high (23 ft-high) sheltered niches cut into the sheer cliff face. These monuments are thought to be dedicated to King Anak Wungsu of the Udayana dynasty and his favourite queens. The Javanese Majapahit kingdom conquered Bali in 1343, and the key final victory was against the Pejeng Dynasty centred at Bedulu, just to the east of Ubud. A great flowering of Balinese culture followed, and the ancestry of Ubud's current day aristocratic families can be traced back to this period. In the sixteenth Century, there was a total transplantation of the Majapahit Kingdom to Bali as the Islamisation of Java forced them eastwards. Power flip-flopped between various dynasties and feudal lords, but the Ubud area remained a very important cog in the various regencies which ruled the island.